Animals unknown to science, including sizable mammals, come to light every day (in fact, 1 every 3 days for the past decade in the Amazon Basin alone!). But parrots, being loud, colorful and active by day, have a hard time remaining undetected, even in remote habitats. Brazil’s Bald or Orange-Headed Parrot (Pyrilia aurantiocephala), however, despite being glimpsed in the past, was only recognized as a distinct species in 2002. The World Wildlife Fund recently announced that over 1,200 new species have been discovered since 1999 in the area of South America drained by the Amazon River, popularly known as the Amazon Basin. The region is a hotbed of diversity (new insects are so numerous that they were excluded from the report, and more fish species have been found in the Amazon than in the entire Atlantic Ocean! 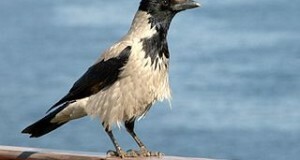 ), but birds accounted for only 16 of the new discoveries. However, among these was a real shocker – a noisy blue and aquamarine parrot with a featherless, orange head. The Bald Parrot had been sighted in the past, but ornithologists believed it to be the immature form of the world’s only other bare-headed Psittacine, the Vulture-Headed Parrot (Pyrilia vulturine). The Vulture-Headed Parrot is truly an odd beast. The first time I worked with them I just couldn’t stop staring at their somewhat “unsettling” naked, jet-black heads. Two bald parrots from the same region were, I imagine, just too much for researchers to buy…despite radically different appearances, both were assumed to be a single species. It was not until Bald Parrots were observed breeding that their true identity was revealed. We know very little about the Bald Parrot’s ecology. It seems limited in distribution to moist lowland and swamp forests in a small region of northeastern Brazil, near the Upper Tabajos and lower Madeira Rivers. The IUCN lists it as Near Threatened, but an accurate census has not been attempted (translation: we know next to nothing of its status!). Its relationship to the Orange-Cheeked Parrot (please see photo) and others within the same genus is unclear. The Bald Parrot’s bare head may be an adaptation to its diet, which seems comprised mainly of large, juicy fruits…head feathers would become fouled by sticky juices during feeding. True Vultures, which thrust their heads into carcasses while feeding, have evolved bald heads as well…an example (as far as we know) of parallel evolution. IUCN Report on the Bald Parrot’s status. Another “Vulture-like” oddity, the Pesquet’s or Vulturine Parrot. Hello Alice, Frank Indiviglio here. Thanks for your interest in our blog. I think here we have a case of “ugly is in the eye of the beholder”…please bear in mind that the parrot needs only to impress others of its kind, not people . 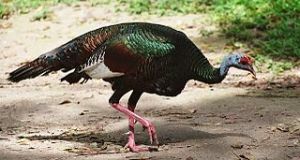 Actually, the bare head is an adaptation to the bird’s diet – it feeds by plunging the head into large, sticky fruits; feathers would become soiled and be hard to clean. 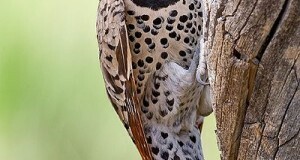 Please check our other articles – there are plenty of photos of unquestionably beautiful birds!